I recently upgraded to smart hub from HH4 and OpenReach modem. I was originally many years ago getting almost full speed (76Mb/s) due to distance from cabinet (I am on infinity2). This degraded as more people and houses were built but I was still getting about 70Mb/s. I thought the new smart hub would be useful to increase my range and so obtained same. Since then I have struggled to get over 61Mb/s. Hi @davidramsay thanks for posting, the router stats show your hub is currently syncing at 65.38 Mbps. The connection time is showing 21 hours was that an intentional reset or is the connection dropping out on its own? Intentional reset, it improved speed of download connection by about 1 Mb/s. Unfortueately the power failed earlier this evening so things may have changed a bit. Actually no change, same download and upload speeds. I have left it over the 14 days before and had auto restarts but things have not improved. @davidramsay Thanks for getting back to me, it looks like your connection speed is just within range of the clean estimate, if you're connection is not remaining stable for whatever reason it could be affecting the speeds you're getting. 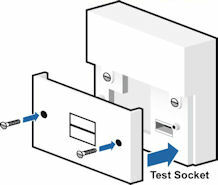 Have you tried connecting directly to the test socket to see if that makes a difference? I did so a wee while ago, the HH6 is plugged directly into the master socket (not the test socket at this moment), there are NO other connections to the master socket. There is little difference, bearing in mind I am using 802.11ac and the TX rate is over 700Mbp/s (I am on a wireless connection and there is NO other 5Ghz band in use in the vicinity). @davidramsay thanks for getting back to me, would it be possible for you to try the test socket for me and then post your router stats for comparison? I would like to see if there is any difference to the SNR margins and Data rates whilst in the test socket. OK due to my having a macbook pro without an enet connection I have placed an enet adapter in the USBC port. Also as there is no way of connecting the phone cable from the Hub to the master socket I have had to use an ADSL filter to gain access to the mini socket. The wireless on the laptop is off. @davidramsay many thanks for doing that, I'm sorry for the inconvenience but hope you can appreciate we need be thorough with the checks to make sure the problem is on the BT network before we get Openreach involved. Please use the 'click here to contact the mods' link in my forum profile to send in your details and we'll get your broadband connection looked at. You can find the link by clicking on my username. sorry but are you now connected to test socket with a filter (master front plate removed) or the master socket with the filter?